Ever since last year's Beijing Olympics, pundits have been predicting that China will be the next great consumer economy. However, the successes and failures of companies that have tried to penetrate the Middle Kingdom suggest that China is not yet ready to emerge as a worldwide market leader. Pace Wildenstein, one of America's most prominent galleries, was among the first super-luxe brands to try a Chinese expansion. On August 8, 2008, shortly before the Olympics opened, the company unveiled a 22,000-square-foot space in the Factory 798 district, the heart of Beijing's art scene. While other Western galleries had opened small venues in the city, Pace's move was regarded as somewhat revolutionary, as it was the first big American art powerhouse to truly commit to China. Hiring local art specialists to run the gallery, Pace quickly assembled a slate of up-and-coming Chinese artists to exhibit alongside Western luminaries like Chuck Close and Cindy Sherman. Over the course of the following year, the silence coming out of Pace Beijing has been deafening. Following an underwhelming opening, the gallery has managed to toddle along, although it seems to owe its continued survival to Pace Wildenstein's dogged determination, rather than to a Chinese art market. Pace's founder and Chairman, Arne Glimcher, recently wrote a Daily Beast article in which he claimed that the Chinese art market is becoming a dominant force in the art world; unfortunately, as Art Journal noted, this may be wishful thinking. Meanwhile, galleries in Factory 798 are closing in droves, unable to make their rent. While Pace Wildenstein was making its move into China, high-end clothing retailer Barneys was contemplating its own Asian expansion. In November 2008, Istithmar, the Dubai firm that bought Barneys, opened an office in Shanghai and began searching for potential spaces in Beijing. However, in the face of the global economic meltdown, those plans seem to have been shelved, at least for the time being. What hasn't disappeared, however, is the notion that China will be the world's next major economic market. Numerous analysts have noted that the country has a large, ambitious population with a huge savings rate and an ever-growing taste for luxury brands. In fact, China Daily recently estimated that, in 2007, 415,000 Chinese had $1 million or more in disposable assets. Luxury brands like Gucci and Cartier have already begun penetrating the market and, according to one Gucci spokesman, China is among the most dynamic areas for the firm. As more and more Western brands begin to eye China as the path to economic salvation, it might be a good time to step back and take a breather. While China's recent stimulus plan should help to put the country back on a strong economic footing, the country is currently stuck in the same crisis that is driving down markets around the world. 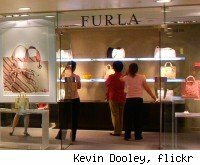 More importantly, the success of some luxury brands, paired with the relative failure of lesser-known companies, seems to suggest that Chinese consumers are eager to seize the trappings of wealth, but may be less inclined to become worldwide fashion leaders. This is good news for industry leaders Gucci and Louis Vuitton, but bad news for up-and-coming companies looking to seize market share.